O Come O Come Emmanuel is a Latin Hymn and is commonly sung during Vespers in the final days before Christmas. The tune was discovered in a 15th-century manuscript containing the melody in the National Library of France. 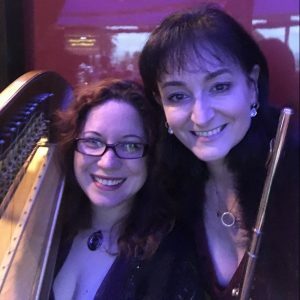 Listen to this beautiful French Carol as performed by our flautist Tresna Stampalia and harpist Catherine Ashley by clicking on our photo below. WE HOPE YOU ENJOY IT AS MUCH AS WE ENJOY PLAYING IT! This versatile duo combination is one of the most exquisite choices to add unique elegance to any wedding service.